Lower segment cesarean section (LSCS) is a common surgical procedure that is most often performed under neuraxial anesthesia. Hypothermia during regional anesthesia is the common side effect and is a cause of shivering. Perioperative shivering can occur in up to 85% of patients undergoing LSCS under spinal anesthesia. Perioperative shivering has many detrimental effects, including increased oxygen consumption, hypoxemia and also impedes monitoring techniques wherein it is imperative that early hypoxia is determined. It is especially important that preemptive measures are taken to reduce shivering, associated with perioperative hypothermia, during LSCS as it may impair the mother's ability to hold her newborn and also postoperatively where it can interfere with bonding and the instigation of breastfeeding. Several pharmacological and nonpharmacological methods have been studied to prevent shivering perioperatively. A study showed a combined effect of tramadol and forced-air warmer in reducing the incidence of shivering in pregnant women undergoing LSCS. Ondansetron, a 5-HT3 antagonist, is a widely used antiemetic, showed its anti-shivering effect following neuraxial anesthesia., In the present study, we chose to study the effect of ondansetron, forced-air warmer and their combination on the incidence of shivering. Core and skin temperatures and the presence and grade of shivering were recorded. After obtaining the Institutional Ethics Committee approval and informed consent from the patients, 120 patients belonging to the American Society of Anesthesiologists physical status Classes I and II, 22–32 years old, full-term pregnant women scheduled for elective LSCS were enrolled into the study. Pregnant women having contraindication to spinal anesthesia, gestational hypertension, placenta previa, and twin pregnancy, weight was <50 kg or >100 kg, cardiopulmonary disease, psychological disorder, and uncontrolled thyroid disease, anemia requiring blood transfusion intraoperatively, those who were febrile were excluded from the study. The study was conducted in the operation theater complex, Department of Anesthesia in our Institute. The study was conducted for 6 months. The primary aim of this study was to evaluate the efficacy of intraoperative forced-air warming, ondansetron or their combination in preventing the perioperative shivering in patients undergoing elective cesarean section under spinal anesthesia. To evaluate the incidence and grade of shivering among three groups. To record skin and core temperatures intraoperatively and relate them to shivering incidence. To assess hemodynamics and the presence of nausea and vomiting intraoperatively. Parturients who were eligible to participate in the study were allocated randomly using a closed envelope technique into one of the three groups. The flow diagram is given in [Figure 1]. Group O (n = 40): Received injection ondansetron 4 mg intravenously (i.v. ), just after subarachnoid block (SAB). Group W (n = 40): Received upper body intraoperative forced-air warming (Bair Hugger, Model 750 warming unit) set at 43°C immediately after SAB and warming device was continued till the end of surgery. Group C (n = 40): Received injection ondansetron 4 mg i.v., and immediate forced-air warming after SAB till the end of surgery. All patients were kept fasting for at least 6 h before surgery. Baseline blood pressure, pulse rate, SpO2, electrocardiograph, skin temperature, and core temperature (tympanic membrane) were recorded preoperatively in all patients. The operation room temperature was adjusted at 21°C–22°C throughout the surgery by monitoring Operating theater (OT) room temperature display. After placing i.v. cannula, patients were co-loaded with Ringer's lactate at room temperature at around 10 mL/kg. SAB was achieved under strict aseptic precautions in the sitting position using a 26 G (Quincke's) needle introduced in the L3–L4 intervertebral space. After obtaining free flow of clear cerebrospinal fluid, 10 mg of 0.5% hyperbaric bupivacaine was injected in the subarachnoid space. The patients were made supine and the wedge was kept under the right hip immediately and forced-air warmer was placed on the upper body of the patient belonging to Group W and Group C. While patients belonging to Group O and Group C were given 4 mg ondansetron i.v. immediately after SAB. Routine surgical draping was the same in all three groups. Surgery was commenced after achieving sensory block to dermatomal level of minimum T6. Grades 3 and 4 shivering for at least 2 min were considered positive, and prophylaxis was regarded as ineffective. An i.v. bolus of tramadol 1 mg/kg was used as a rescue drug. The incidence of hypotension, bradycardia, nausea, and vomiting was recorded. Hypotension was defined as fall in blood pressure by 20% from the baseline or an absolute mean arterial pressure <60 mmHg; which was managed by increments of i.v. mephentermine 6 mg. Bradycardia defined as absolute heart rate (HR) <50 beats/min; which was managed by 0.6 mg i.v. bolus of atropine. Patients with refractory nausea or vomiting were treated with 10 mg metoclopramide i.v. Maternal data and parameters such as noninvasive blood pressure, HR, SpO2, and skin and core temperatures were recorded in immediate preoperative, after entering into the operation theater, immediately after the establishment of SAB and every 3 min for the initial 15 min, followed by every 15 min until the end of surgery. Core temperature was measured at tympanic membrane (dewaxed ear and same ear throughout surgery) using tympanic temperature probe (Beurer FT 58 device with disposable protective caps), and the skin temperature of the upper arm was measured using skin probe at the same time durations. The sample size was calculated based on the results of the previous study which showed that ondansetron can reduce the incidence of postspinal shivering to 8% compared to the control group. A sample size was calculated based on these findings, with a value of α = 0.05 and power (1-β) of 0.80. It was calculated that 36 patients were required per group. We included forty patients in each group (total of 120 patients) for better validation of results and any other causes for attrition. Data values are presented as mean (standard deviation), median (range), or number (percentage). Parametric data were analyzed using one-way ANOVA and the Student's paired t-test where appropriate. Nonparametric data were analyzed using the Kruskal–Wallis and the Chi-square test. A value of P < 0.05 was considered statistically significant. Statistical analysis was performed using the SPSS windows version 19 (Statistical Package for the Social Sciences (SPSS) windows version 19 by IBM Corporation). Maternal demographic and obstetric data were comparable among all three groups as mentioned in [Table 1]. There was no difference among the groups with regard to the median level of age, height, weight, duration of surgery, and sensory level of SAB attained. There was no change of anesthetic plan due to inadequate level of block in the study period. In the present study, we found that the incidence of postspinal shivering was less in all three groups compared to the incidence which was up to 85% as observed in a previous study. Incidence and severity of shivering among three groups are mentioned in [Table 2]. It was observed that the incidence of shivering in Group C (5%) was less than Group W (20%) and Group O (17.5%). ANOVAs among groups showed P = 0.12. However, the incidence of shivering when compared between groups showed an absolute t value of 2.06* between Group W and C which is statistically significant. Whereas t value was 1.78 (Group O vs. C), and 0.28 (Group O vs. W) was not statistically significant. Despite the incidence of shivering being more in Group W, greater incidence of Grade 3 shivering (10%) was present in Group O compared to that of the Group W (5%) and Group C (2.5%). Patients in Group O required more rescue drug (tramadol i.v.) than that of the Group C and Group W.
Core and skin temperatures of all the three groups at baseline and at 30 min interval are mentioned in [Table 3]. The changes in core temperature in each group are given in [Figure 2]. Initial core temperatures were comparable in all the three groups. The mean core temperatures decreased from baseline in all three groups and the least recorded value was in Group O (35.78 ± 0.2) at 30 min, relative to the other two groups where forced-air warming was used (Group W 35.85 ± 0.14, Group C 35.99 ± 0.176). The changes in skin temperature in each group are given in [Figure 3]. Initial skin temperatures were similar and comparable in all the three groups. Initial mean skin temperatures in Group O were 33.9 ± 0.2 which decreased to 33.75 ± 0.15 at the end of 30 min, whereas in Group W (35.04 ± 0.21) and Group C (35.35 ± 0.35), they increased from their baseline values. Number of patients with core temperature <36°C, 30 min after SAB were 37% in Group C, 75% in Group W, and 82% in Group O, with P < 0.05 between Group C and Group W, and not being statistically significant between the warmer and ondansetron groups (P = 0.448). Mephentermine dose between three groups was not statistically significant (P = 0.27). Tramadol dose (as rescue drug for Grade ≥3 shivering) between groups showed a P = 0.21, which was comparable. Average time spent inside the operation theater was comparable with P being 0.9. Nausea and vomiting were observed in one patient in Group O, three patients in Group W, and one patient in Group C. APGAR scores were comparable, and none of the newborn required neonatal intensive care unit admission. Shivering is a spontaneous, involuntary, and unpredictable muscular activity. General theory assumes the cause of shivering to be a classic thermoregulatory response against core or skin hypothermia caused by the perioperative heat loss. However, some of it is believed to be nonthermoregulatory because it is also observed in normothermic patients. The neurotransmitter pathways involved in the mechanism of shivering are complex and still poorly understood. The perioperative hypothermia is defined as core temperature <36°C. Intraoperative hypothermia during neuraxial anesthesia is triggered by various mechanisms such as redistribution of body heat from core to periphery, inhibition of central thermoregulatory control, and even the shivering threshold is reduced by about 0.5°C during neuraxial anesthesia. The best way to avoid the intraoperative and postoperative shivering-induced complications is to prevent it. Ondansetron, a 5-HT3 antagonist, is a widely used antiemetic, showed its anti-shivering effect following neuraxial anesthesia. Although the mechanism of action of ondansetron as anti-shivering is not clear, it is proposed to act centrally at the level of the preoptic anterior hypothalamic region by the inhibition of serotonin reuptake. Ondansetron besides being antiemetic, was found to reduce the incidence of shivering in various studies performed on lower abdominal and orthopedic surgeries under regional anesthesia.,, The incidence varied between 8% and 15% in above-mentioned studies, which is less compared to the present study where the incidence was 17.5%. This difference can be rationalized by the facts that our study group was limited to pregnant women where the incidence of shivering is higher and even physiological changes of pregnancy with volume overload may affect the pharmacokinetics and pharmacodynamics of the studied drug. Another recent study showed that ondansetron when used in LSCS reduced the incidence of shivering to 10%. This result differed from our incidence which was 17.5%. This can be attributed to use of higher dose of ondansetron (8 mg i.v.) and use of warm fluids in the above mentioned study. In Group W, the incidence of shivering was 20%. This result is in concordance with a meta-analysis which concluded that active warming for elective cesarean delivery decreases the incidence of hypothermia and shivering. There was study showing that active forced-air warming device when started preoperatively itself and continued intraoperatively decreased the incidence of shivering and their results were comparable to this study. A study also recommended necessary time for effective prewarming between 30 and 60 min. However, such long periods of active prewarming for patients before surgery may lead to significant organizational delays in hospitals with higher load of LSCS like ours. Recent ERAS protocol for obstetric surgery recommends forced-air warmer should be routinely practiced for LSCS. This was the only study to our knowledge assessing the effectiveness of the combination of i.v. ondansetron 4 mg and intraoperative forced-air warming on shivering. The results inferred that the lower incidence of shivering was about 5% in the Group C compared to that of the Group O (17.5%) and Group W (20%) further reiterating the other effects of ondansetron besides the antiemetic properties. Group C also showed reduced incidence of Grade 3 shivering wherein only one patient required rescue drug. A study used the combined effect of i.v. tramadol and preoperative forced-air warming which reduced shivering incidence to 0%. Combined interventions, including warmer and drug, could affect both thermoregulatory aspects and neurotransmitter pathways of shivering thus having additive effects in reducing the incidence of shivering. In this study, core temperatures decreased from base line in all three groups at the end of 30 min, the decrease being more in Group O. Skin temperature at the end of 30 min was also decreased in Group O. While Group W and Group C showed an increment from their baseline, which can be attributed to the use of forced-air warmer in both the groups. Although the difference between core and skin temperature at the end of 30 min was more in Group O compared to that of the Group W, the incidence of shivering was less in Group O. This underlines the multifactorial causes of shivering and proposing a central effect of ondansetron in reducing the shivering. However, the incidence of Grade 3 shivering was higher in Group O (10%) compared to the Group W (5%), which required further management with rescue drug. This can be attributed to wider margin in the difference between core and skin temperatures in Group O. According to the definitions of hypothermia, the incidence of the drop in core temperature was least recorded in the Group C (37%) which was statistically significant (P < 0.05), adding further evidence to the use of two techniques acting synergistically than the individual techniques themselves. Combined use of ondansetron and forced-air warmer was more effective in reducing the incidence of shivering than when used individually in pregnant women undergoing elective cesarean section. Limitations in this study are that warm fluids were not used and warmer could only be started inside the OT due to logistic issues. Blinding could not be done. Further research should be carried out to bring evidence regarding the use of ondansetron, forced-air warmer or their combination as part of the protocol in obstetric practice in reducing the incidence of shivering. We would like to thank our fellow colleagues and other operation theater staff who laid their helping hand in completion of this study. We would like to thank Mr. Murali statistician who helped us in statistical data analysis. Frank SM, Beattie C, Christopherson R, Norris EJ, Rock P, Parker S, et al. Epidural versus general anesthesia, ambient operating room temperature, and patient age as predictors of inadvertent hypothermia. Anesthesiology 1992;77:252-7. Roy JD, Girard M, Drolet P. Intrathecal meperidine decreases shivering during cesarean delivery under spinal anesthesia. Anesth Analg 2004;98:230-4, table of contents. Sessler Daniel I. Temperture monitoring. In Anesthesia; Roland D. Miller 5th edition. Philadelphia, Pa; Churchill living stone;2000. De Witte J, Sessler DI. Perioperative shivering: Physiology and pharmacology. Anesthesiology 2002;96:467-84. Yousef GT, Elsayed KM. Effect of forced air prewarming, tramadol or their combination on prevention of hypothermia and shivering during cesarean section under spinal anesthesia. ZUMJ 2013;19;304-10. Shakya S, Chaturvedi A, Sah BP. Prophylactic low dose ketamine and ondansetron for prevention of shivering during spinal anaesthesia. J Anaesthesiol Clin Pharmacol 2010;26:465-9. Kelsaka E, Baris S, Karakaya D, Sarihasan B. Comparison of ondansetron and meperidine for prevention of shivering in patients undergoing spinal anesthesia. Reg Anesth Pain Med 2006;31:40-5. Wrench IJ, Cavill G, Ward JE, Crossley AW. Comparison between alfentanil, pethidine and placebo in the treatment of post-anaesthetic shivering. Br J Anaesth 1997;79:541-2. Kongsayreepong S, Chaibundit C, Chadpaibool J, Komoltri C, Suraseranivongse S, Suwannanonda P, et al. Predictor of core hypothermia and the surgical intensive care unit. Anesth Analg 2003;96:826-33. Feldmann ME. Inadvertent hypothermia: A threat to homeostasis in the postanesthetic patient. J Post Anesth Nurs 1988;3:82-7. Horn EP, Sessler DI, Standl T, Schroeder F, Bartz HJ, Beyer JC, et al. Non-thermoregulatory shivering in patients recovering from isoflurane or desflurane anesthesia. Anesthesiology 1998;89:878-86. Polderman KH, Herold I. Therapeutic hypothermia and controlled normothermia in the intensive care unit: Practical considerations, side effects, and cooling methods. Crit Care Med 2009;37:1101-20. Matsukawa T, Sessler DI, Christensen R, Ozaki M, Schroeder M. Heat flow and distribution during epidural anesthesia. Anesthesiology 1995;83:961-7. Safavi M, Honarmand A, Negahban M, Attari M. Prophylactic effects of intrathecal meperidine and intravenous ondansetron on shivering in patients undergoing lower extremity orthopedic surgery under spinal anesthesia. J Res Pharm Pract 2014;3:94-9. 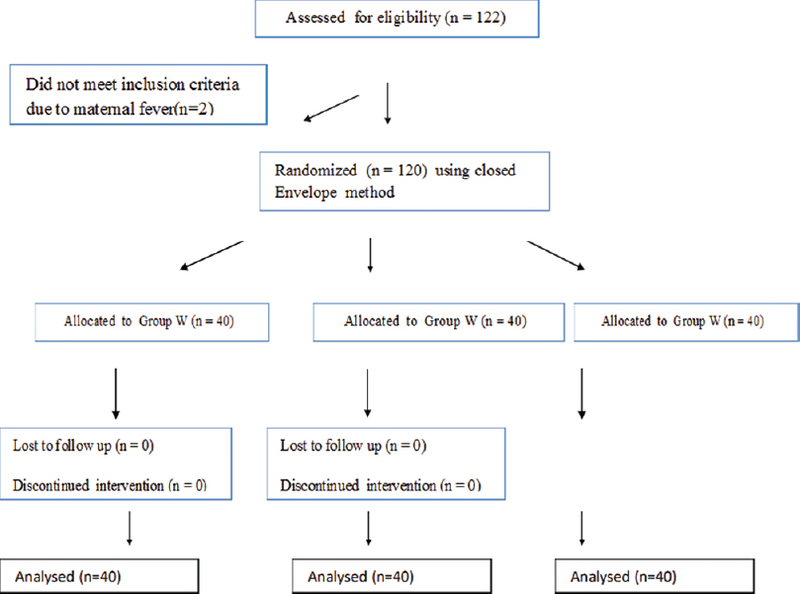 Nallam SR, Cherukuru K, Sateesh G. Efficacy of intravenous ondansetron for prevention of postspinal shivering during lower segment cesarean section: A double-blinded randomized trial. Anesth Essays Res 2017;11:508-13. Powell RM, Buggy DJ. Ondansetron given before induction of anesthesia reduces shivering after general anesthesia. Anesth Analg 2000;90:1423-7. Asl ME, Isazadefar K, Mohammadian A, Khoshbaten M. Ondansetron and meperidine prevent postoperative shivering after general anesthesia. Middle East J Anaesthesiol 2011;21:67-70. Tie HT, Su GZ, He K, Liang SR, Yuan HW, Mou JH, et al. Efficacy and safety of ondansetron in preventing postanesthesia shivering: A meta-analysis of randomized controlled trials. BMC Anesthesiol 2014;14:12. Sultan P, Habib AS, Cho Y, Carvalho B. The effect of patient warming during caesarean delivery on maternal and neonatal outcomes: A meta-analysis. Br J Anaesth 2015;115:500-10. Horn EP, Schroeder F, Gottschalk A, Sessler DI, Hiltmeyer N, Standl T, et al. Active warming during cesarean delivery. Anesth Analg 2002;94:409-14. Caughey AB, Wood SL, Macones GA, Wrench IJ, Huang J, Norman M, et al. Guidelines for intraoperative care in cesarean delivery: Enhanced Recovery After Surgery Society Recommendations (Part 2). Am J Obstet Gynecol 2018;219:533-44.